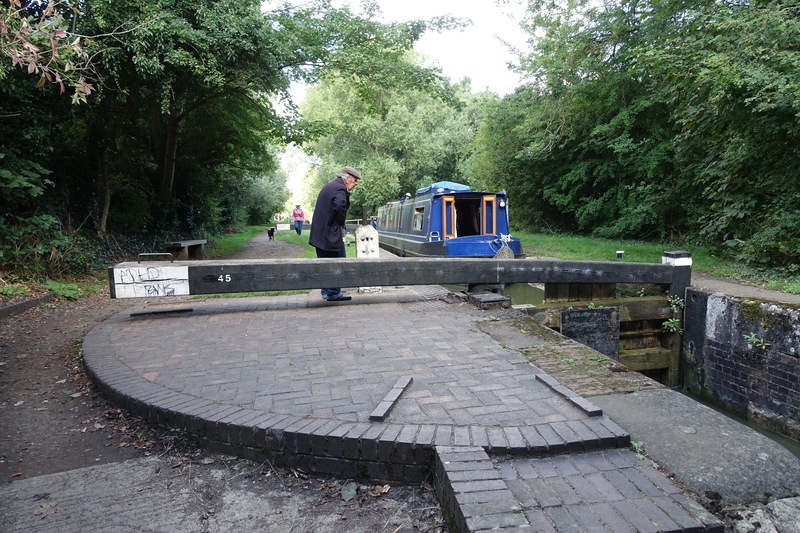 We met Barry the volunteer lock master at the Wolvercote Lock on our walk Sunday from Oxford to Kidlington, an eight-mile ramble along the tow path. Our guide on this trek is “British Footpath Guide” by Richard Hayward of Bellingham, WA, and much of the information here is taken from that book. Barry operates the lock for a narrow boat on the Oxford Canal. 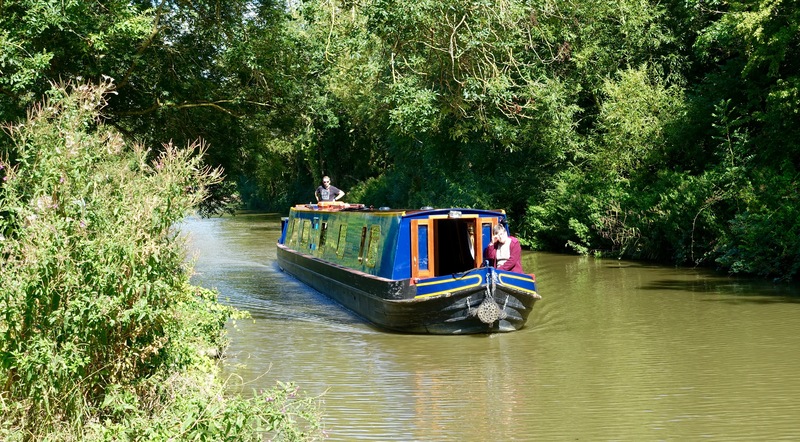 The Oxford Canal was part of a vast system built between 1760 and 1820 to transport coal and other goods. Today the boats plying the canals are “narrow boats,” mostly carrying vacationers and folks partying. We were surprised at how quietly the diesel engines propel these long boats. But then they are going very slowly, probably not much faster than the original boats pulled by a single horse along the tow path — about two miles an hour. Narrow boats ply the Oxford Canal. The boats moored along the canal did range from the well kept to the derelict. We saw lots of moss and mold on some and a shiny surface on others. We stopped and watched several boats make their way through locks, many of them operated by the boaters themselves when there was no Barry around to help. We saw more of what we have come to call “giant pigeons.” Earlier we had also referred to these as mourning doves, but have since identified them via the National Geographic web site as likely wood pigeons, Britain’s most common variety. 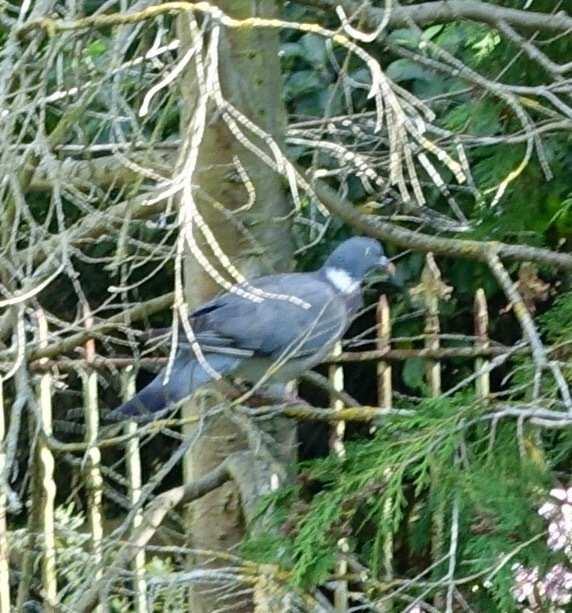 We hear them each morning outside our apartment and spy them in trees and on steeples all over the place. Many of the houses along the canal had beautiful, well-kept gardens trailing down to the water. 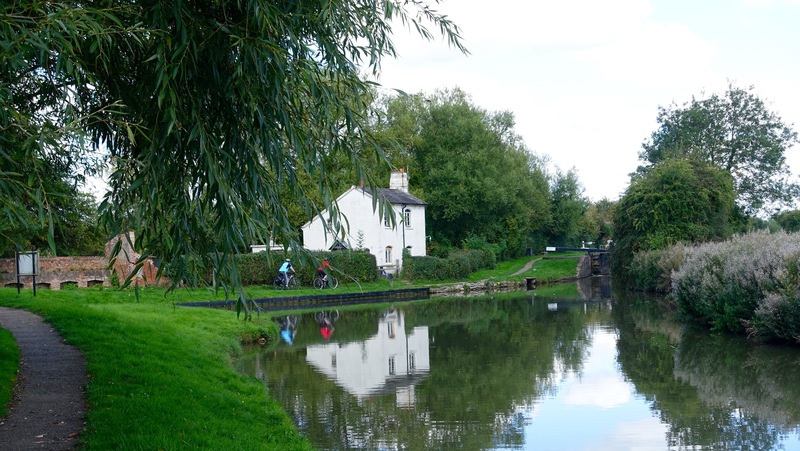 There, patios, benches and small sheds or boathouses offer places to entertain or to sit quietly and enjoy the canal. A house along a wide place in the canal. The tow path is shared by walkers, bikers and runners and was quite busy on our sunny and warm Sunday afternoon. At Kidlington, we ate at the Black Horse pub where we shared lively conversation on politics and culture with two British coach (bus) drivers. Jason seemed incredulous about Donald Trump as a presidential candidate (who isn’t?). Mark had lots of advice on wealth versus happiness, the virtues of marriage and the pleasures of a Sunday afternoon with Guinness (which is becoming Kathy’s favorite drink).